The Jukskei River rises in Johannesburg and flows northwards, crossing into Bedfordview, Ekurhuleni, and back to Johannesburg. It joins the Crocodile River shortly before it enters Hartebeespoort Dam. The two great problems of the Jukskei River catchment are sewage pollution and flooding. The sewage problem is constant, while the flooding happens at intervals and tends to be overlooked during dryer times. The map shows the catchment with the main features and monitoring sites. The greatest problem of the Jukskei River is sewage pollution. This comes from aging infrastructure and a backlog of maintenance, and in some cases the use of superimposed sewage and stormwater systems, with interlinks for access. It is therefore common for sewage and stormwater to mingle if the interlinks fail. City of Johannesburg quarterly water quality reports show two peak inflows of sewage pollution. The first peak is at the source of the river in central Johannesburg. It comes from the hundreds of bad and hijacked buildings which have no services, so their sewage runs into the stormwater system. The second peak is from Alexandra, where decades of unplanned development has covered over access to the underground system and brought about over capacity. In the Upper Jukskei River water quality is tested quarterly by both Johannesburg and Ekurhuleni. 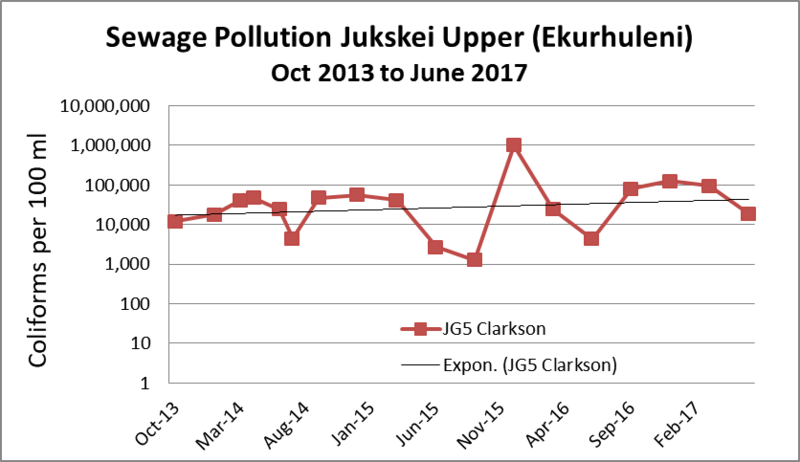 Ekurhuleni monitors a single site at Clarkson Rd, Morninghill in Bedfordview, while Johannesburg monitors about 16 sites along the Jukskei itself, but they tend to change over time. Edenvale RiverWatch has reports since 2014 from Ekurhuleni and 2015 from Johannesburg. 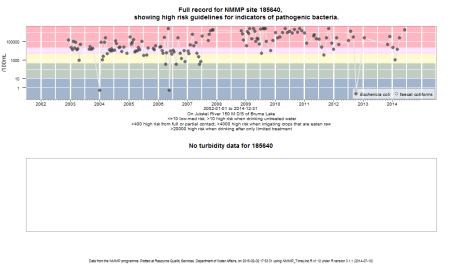 The National Microbiological Monitoring Program (NMMP), which falls under Department of Water and Sanitation, gives longer term results from 2003 to 2014. Reporting through NMMP at this site stopped in 2014, after the Bruma Lake was removed. 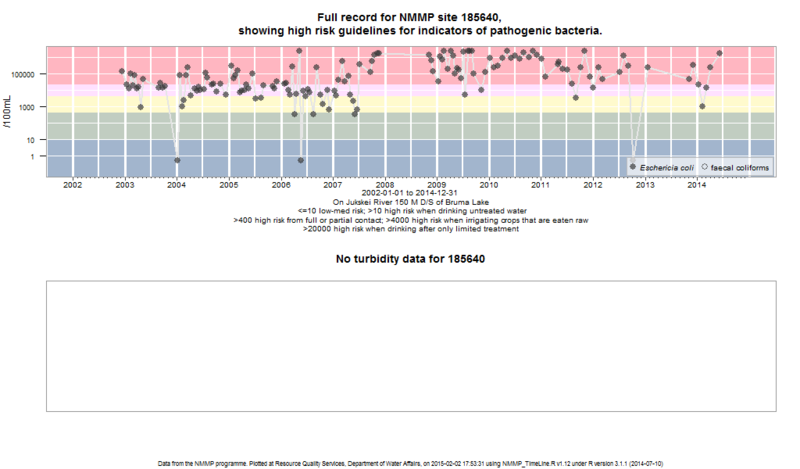 The 11-year graph from NMMP shows faecal contamination is extremely high, over 1 million counts per 100 m/L. Note that this is a log plot and visually rather flattened, so it is not easy to recognize a jump of about 100-fold in 2008. Ekurhuleni monitors water quality at Clarkson Road in Morninghill (their site JG5). They measure faecal coliforms per 100 ml, not the same as E coli but a similar indicator of sewage pollution. Sewage pollution has increased steadily from October 2013 to March 2017 with a seasonal low in winter. Ekurhuleni water quality results give a 3-year trend. 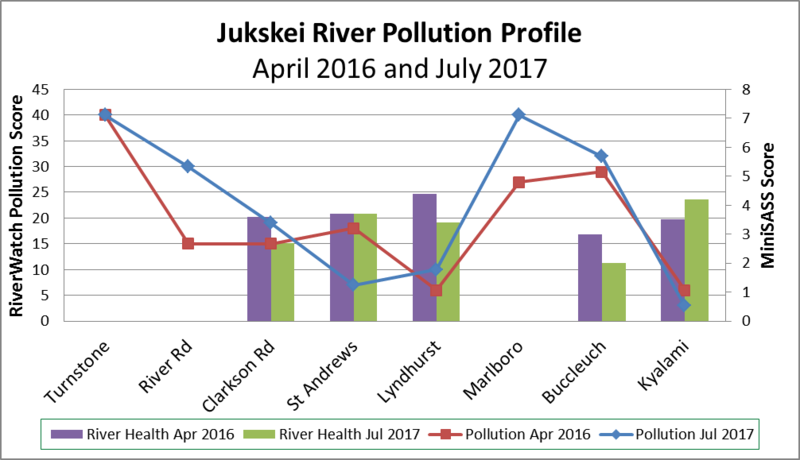 Monitoring by Edenvale RiverWatch of river health shows the health of the river is the inverse of the level of pollution with lows near Johannesburg CBD and Alexandra but in each case improving downstream. While the river health improves, it does not rise above “Very Poor” ecological category which is the lowest level. At Bruma above Queen Street (Turnstone site) and Marlboro Road Bridge The condition of the stream bed is too contaminated to to test for River health. River health at all sites deteriorated from 2016 to 2017 except Kyalami, but Kyalami is on a longer term deterioration (see below). Jukskei River Health shows a steady deterioration over two years at Kyalami. This graph shows two measures of invertebrates presence. The horizontal axis SASS shows how much invertebrate life there is, and the vertical axis Aver Score per Taxon shows it’s quality. The box lines drawn are the boundary between Ecological Categories D (Poor) and E/F Serious/Critical. The health of the river has moved from Category D to Category E/F. 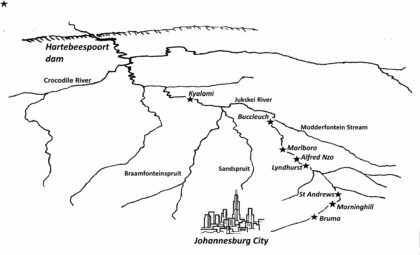 Johannesburg and the rest of the Witwatersrand conurbation sits over the continental divide. The Jukskei River in the north flows toward the Limpopo River and to the Indian Ocean. The Vaal River in the south flows to the Atlantic Ocean. 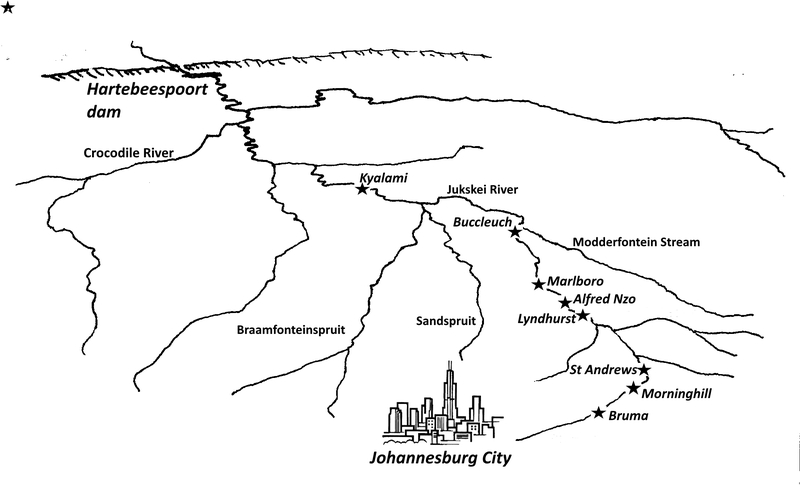 The city receives its water from the Vaal catchment, but the waste water flows northwards into the Jukskei catchment. Development, poor stormwater infrastructure and maintenance backlog cause increased run-off and flooding. This applies to both Johannesburg and Ekurhuleni. Read further on how our variable climate, rainfall cycles and the impact of development increase risk of flooding here: Rainfall and Jukskei River Catchment Information. The flood lines are inadequate and the developers underestimate the risk of flooding. 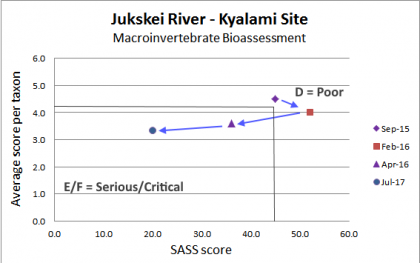 Evidence is presented that peak flows in the Jukskei River have risen 10-fold over fifty years and will continue to increase. The plans for managing storm water run off are inappropriate and inadequate – they ignore national, provincial and municipal guidelines. Environmental authorization for the project was issued on 5 June 2015, subject to some conditions. The Environmental Assessment Practitioner for this project (GAUT:002/13-14/E0153) is Bokamoso Environmental. See Linksfield development comment Irwin Juckes for comment on the draft.